Which Falls Faster, Josh or a MacBook Pro? Mentioned in Seth Godin’s Meatball Sundae The Double Standard: Does Target Get a Social Media Pass? Those of you that follow me via Twitter learned last weekend that I feel down some stairs. That in itself was not fun, luckily I didn’t break anything and came away with a nice hematoma, that as of today is a nice yellow-brown color. However, I wasn’t the only thing that fell down the stairs. My MacBook Pro joined me in the ‘flight’ down the flight of stairs. What was surreal is that the entire fall seemed to last forever and the entire time I saw my Mac sliding next to me, just out of reach. We did reach the bottom at the same time, which answers the age-old question, which falls faster Josh or a MacBook Pro….it’s a trick question, they fall at the same rate. 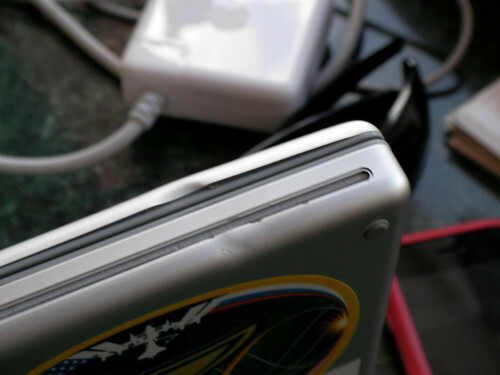 The damage to the MBP was mostly cosmetic as you can see, but it still requires a bit of repair to the external case. Could have been worse though. 5 Responses to Which Falls Faster, Josh or a MacBook Pro? So what’s the price for the repair? I’m guessing around 1200 bucks if apple does it. Anyway I fixed it myself for a lot cheaper than the $800 Apple wanted! I still have various screws and bits of plastic that never made it back in. But it works! Glad to see you survived the fall in good shape, Josh. You would certainly be a lot harder to replace than your MBP.